Conversation around the sound stage had silenced. The cast and crew of Last Dime had all rotated like some automaton the moment the man in front of him had pushed onto the set. Most of them were dressed like laborers from the 1930s, with torn trousers and battered hats. If you ignored the lights and the crew in modern dress, it could be a labor meeting during the Great Depression — not a happy labor meeting at the moment. Go to Shareable: Playing Against Type to read the whole thing. I have three stories that will appear on Sharable.net over the next three days. They are examining what it might be like to make a film in a future with an economy based on sharing and cooperation. Each story can stand alone but hopefully you get more out of them when they are read as a whole. It’s the first time I’ve tried to write a mosaic story. Here’s a teaser of the first one. Jenn stared at his chin, focusing on the stubble and hoping that her distaste didn’t show. Why had she borrowed Harold’s tools? Now she owed him. Harold’s request to borrow one of her typewriters for the film he was making was perfectly reasonable, but this did nothing to keep the sour taste out of the back of her mouth. When she’d traded borrowing points, she hadn’t thought the typewriters would be in danger. No one used them anymore. She’d thought she was throwing skills or tools into the communal pot when she immigrated to this co-op. At her old one, no one cared about the typewriters. Was there a way she could say “No,” plausibly? Oh, and it has pictures of our actual typewriter collection. As you know, the Hugo nomination period is open. I thought I’d post a list of my stories published in 2009. Just a reminder, I recused myself from SFWA Nebula eligibility this year, so none of these are Nebula eligible. I’ve bolded my favorites. If the story title has a link, you can read the story online. I know this idea will come as an anathema for many people, but as Rob and I get ready to move, I’m getting rid of most of my fiction. Let me rephrase that. I’m getting rid of the book forms of most of my fiction. I realized that I moved books out here that I haven’t read since before I moved them to Portland, OR back in 1993 and that some of them probably haven’t been opened since before that. Don’t get me wrong, these are all books that I loved, but do I need to own them still when I don’t read them? I’m using a barcode scanner and saving a list of them on LibraryThing, so if I ever miss one I can remember that I owned it and then buy a new copy, although that new copy will likely be electronic. The ones that I’m keeping are the ones where the physical artifact has meaning. The complete collection of Narnia that my grandmother gave me? Stays. The copy of Small Gods, which was the first book I read aloud to Rob? Likewise, that’s a keeper. I’ve sort of been doing this for awhile with new books. I finish reading them, then mail them to my niece or nephew. * But all the older books? Iif I haven’t opened it since I moved here, I’m shedding it and not because I don’t love them. My question is, since I want them to go to a good home, how should I go about it? *By the way, if you see one of your books on the list, please don’t be offended. KGB fantastic fiction — tonight! Hey come down to the KGB bar tonight at 7:00 pm for the KGB Fantastic Fiction reading series to hear Brian Francis Slattery and me read. As an added enticement, I’m including a very short monologue with a puppet. Brian is bringing a bass, a violinist and fiction! Should be fun tonight. My friend, Sean Markey, has his first pro sale up at Strange Horizons. It is a dark and weirdly creepy story. We kept our god under the sink, in an old aquarium, so it wouldn’t spill its web all over the house. We didn’t tell you because you were so curious. Our daughter: you are like an otter, or a hummingbird. How would you stand against such a monster as our god? Read The Spider in You, by Sean E. Markey. We’re having a conversation on puptcrit (Puppet Critique), which is a listserver for puppeteers, about scripting for puppet theater. One of the major problems with writing for puppet theater is that it is a very specific and different skill set from writing for live actors. I don’t write the scripts for our shows, because that’s not where my skills lie. It’s totally different from fiction. Puppets can do things that actors can’t as well as having limitations that actors don’t. In the course of the conversation, I talked about the importance of finding a playwright who understands, or is willing to learn, about writing for puppet theater. Frequently, a show is largely non-verbal. The question came up: How do you script a non-verbal show? Okay, so that thing I said earlier about that I don’t write for stage? My one play was non-verbal and was awarded an UNIMA Citation. The reason I bring it up now is that several years ago, we did an experiment with MUM Puppet Theater and shipped them our script and puppets. By all accounts, the show had the same impact on the audience as our original play did. The way I did it was that I scripted the characters’ intentions AND their actions. My feeling is that body language is a non-verbal expression of what a character is thinking and feeling. So writing, “Character picks up rock” tells you what happens, but the way you pick up a rock if you’re planning on killing someone is different from if you think it’s pretty. It might be body language, but it is still language. Since I can’t attach things to posts on puptcrit, I told everyone that I’d post it here. Sorry non-puppet folks, for dropping you into the middle of a larger conversation. The postman arrived today with a package, which was puzzling since I hadn’t ordered anything for props recently. Behold! 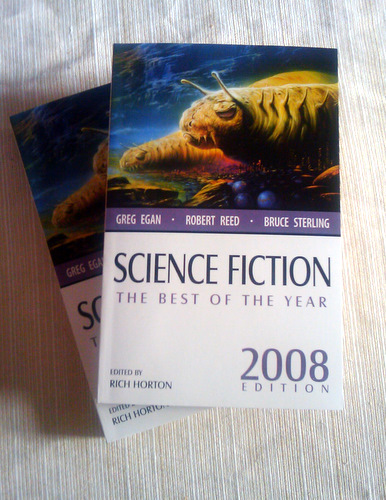 Contributor’s copies of Science Fiction the Best of the Year, 2008, edited by Rich Horton. My story, “For Solo Cello, op. 12” is in there. The science fiction and fantasy community likes to honour the writers in its ranks, and no honour comes higher for new writers than the John W Campbell award. Previous winners include Orson Scott Card, Stephen Donaldson and Cory Doctorow, so it’s certainly worth watching. 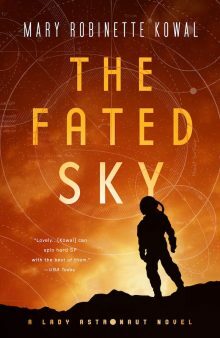 This year, Mary Robinette Kowal beat a strong shortlist to scoop the award on the basis of a clutch of well-crafted short stories that showcase her emotional deftness while still telling strange and exhilarating stories in the SF tradition. Thanks Mr. Walter!Â This is an excellent pre-birthday present. Here, let me offer a party favor! Â This is an audio version of “Evil Robot Monkey” from the 2008 edition of the Solaris New Book of Science Fiction. via Damien Walter on exciting new SF and fantasy writers | Books | guardian.co.uk. My twitter fiction is up atÂ Thaumatrope: “When shall we three meet …. I’d love having a reader or two look over this one before I send it out. It is 7300 words of science-fiction. It’s in a password protected post, but you can drop me a line and I’ll tell ya. Mary Elois Jackson stood inside the plain steel box of the time machine. It was about the size of an outhouse, but without a bench or windows. She clutched her cane with one hand and her handbag with the other. Her corset creaked with every breath. She’d expected to hate wearing a corset again but there was a certain comfort from having something to support her back and give her a shape more like a woman than a sack of potatoes. A gust of air puffed all around her and the steel box was gone. She stood in a patch of tall grass under an early morning October sky. The caravan of scientists, technicians and reporters had vanished from the field where they’d set up camp. Elois inhaled with wonder that the time machine had worked. Assuming that this was 1905, of course. Even if you don’t have time to read it, I’ve got a title question.Â My working title was “Time-travelling Grandma” which I’m sort of tempted to go back to.Â Thoughts? I failed to link to two of my twitfics up at Thaumatrope. There’s not any real way to do a teaser of fiction that’s only 140 characters long. So… This story from Christmas Eve is not safe for family. And the story from Christmas day is.